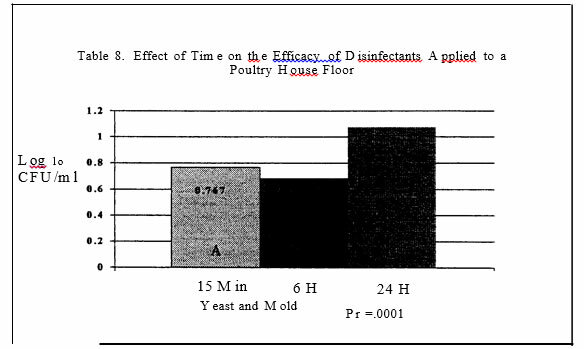 Poultry house sanitation plays a crucial role in the reduction of pathogens and biological load. Removal of old litter followed by Cleaning and disinfecting of facilities helps reduce pathogen numbers and break disease cycles. In addition, as live production becomes the target area of programs for the reduction of human pathogens such as Campylobacter and salmonellae on poultry carcasses, it will become necessary to document that sanitation procedures are effective. Unfortunately, poor sanitation procedures and/or increased soil m9isture levels have been linked to increased or sustained bacteria levels (Rudolfs, et. al.1950. Pepper et. al., lp93.). Often poultry house sanitation is begun with the best intentions, but ih reality, falls short of the thorough cleaning and disinfection process required for maximum effectiveness. A key reason for failures in the sanitation process is the lack of effectiveness that many disinfectants have in the presence of organic matter such as soil and litter. 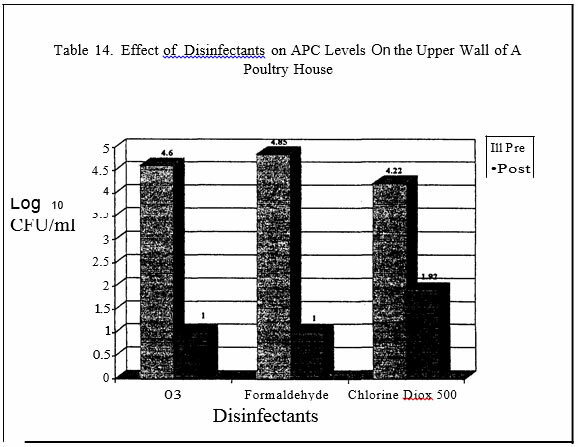 This report details a series of experiments conducted to evaluate disinfectant efficacy in the poultry house environment. 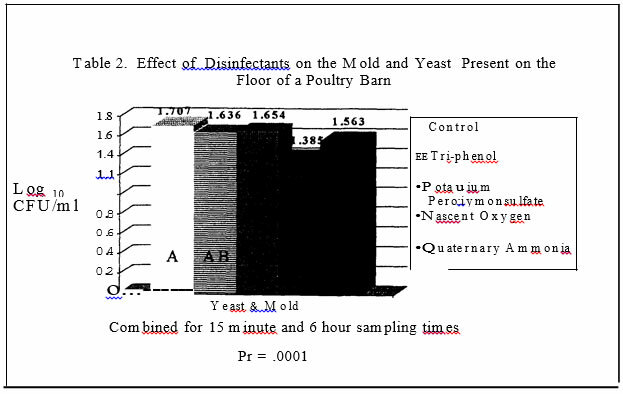 Commercial poultry houses were utilized as the test sites for the evaluation of commonly used disinfectants. After the litter was removed, an area in the middle of the houses was swept clean of any loose litter. One foot by one-foot plots were then randomly assigned to one of four disinfectant treatments. In trial one, each disinfectant was applied to ten plots and in trial two each disinfectant was applied to twelve plots. In each trial, untreated plots served as the control. 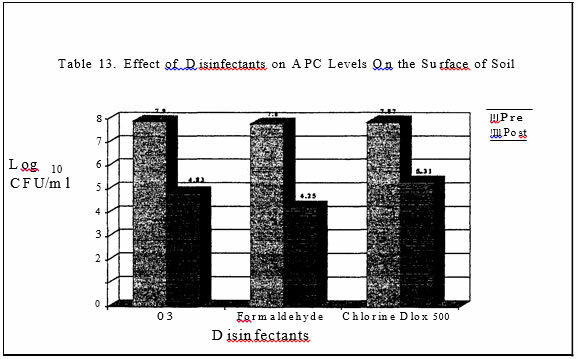 In both trials, the disinfectants evaluated were a phenolic compound, a quaternary ammonia compound, a nascent oxygen compound (03) and potassium peroxymonsulfate based product. All products were mixed following manufacturers’ recommendation with distilled deionized water. In trial I , the disinfectants were applied at a rate of I 0 ml/square foot and in trial 2, the rate of application was 125 ml/plot. In trial 1, one half of the plots were sampled 30 minutes after disinfectant application and one half was sampled six hours after application. In trial 2, one third of the plots were samples at 30 minutes, 6 hours and twenty-four hours post disinfectant application. Sterile drag swabs were used to collect samples. Aerobic plate counts, yeast and mold, e. coli, campylobacter and Salmonella levels were evaluated. 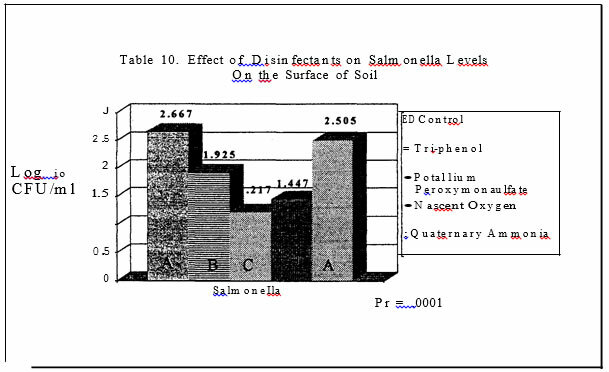 In the second series of trials the same disinfectants were applied to square foot pans of top soil (2 pounds/pan) which had been inoculated with Salmonella that is Nalidixic acid resistant.. Disinfectant application rates in these trials were 40 ml/pan in the first experiment and 55 ml/pan in the second experiment. Pans inoculated with Salmonella but untreated with disinfectant served as the controls. All pans were sampled with sterile drag swabs four hours after disinfectant treatment. In the final series of trials, commercial broiler grow-out and turkey brood and finish barns served as the test sites for the evaluation of the microbial load pre and post house sanitation. Litter was completely removed from the houses. Prior to the wash down step of the barn, sterile drag swabs hydrated with sterile water were used to obtain estimates of microbial counts on the floor of the barn, walls and outside curtain. Each house was sampled in two places per site. The floor was sampled by dragging a sterile, hydrated swab in a zig-zag pattern in an area encompassing the outside water line to the middle of the house for the length of the house. Both sides of the house were sampled. ·Areas were sampled pre and then two hours post dis-infection. Aerobic plate counts, E. coli, coliform, mold and yeast levels were determined. In addition to the disinfectants used in the previous trials, the following were also evaluated: gluteraldehyde, glutericide, formaldehyde and chlorine.dioxide. Disinfectants were mixed and used in accordance to Manufacturers’ recommendations. In one case, the Nascent oxygen product mixed with Citric acid instead of the Manufacturers’ acidifying agent. 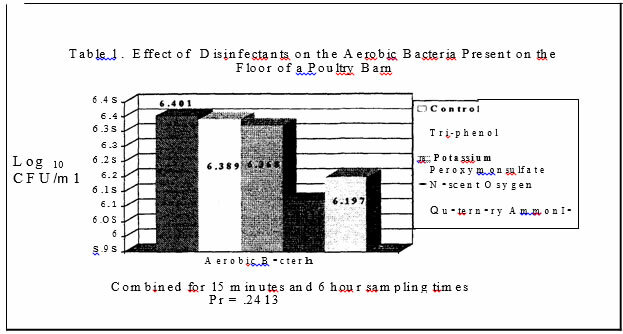 For trials one and two, statistical analysis indicated no interaction between disinfectants and sampling time for aerobic bacteria, mold and yeast levels. 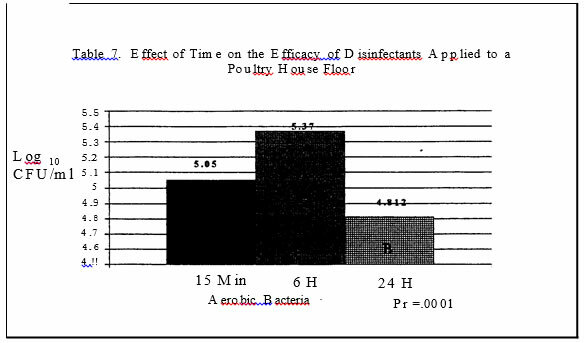 No interaction occurred for disinfectants and time of sampling for incidence of Campylobacter in trial one. Campylobacter was present in spite of disinfectant treatment. No Campylobacter was detected in trial two. 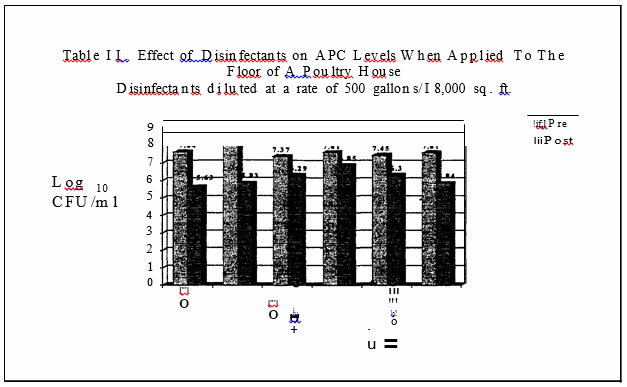 Sampling times were combined for the analysis of disinfectants. 2) were influenced by disinfectants with the Nascent Oxygen product resulting in the lowest levels. 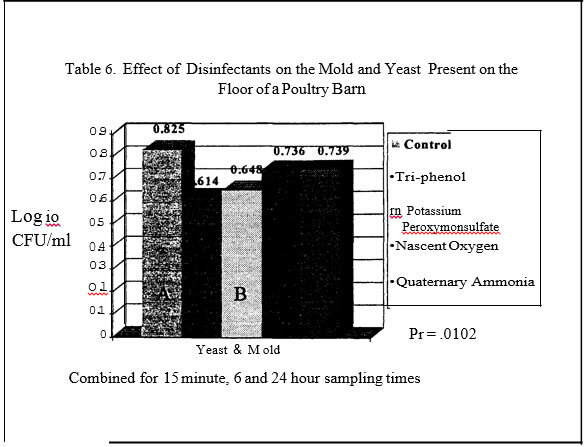 In trial two, disinfectants again reduced mold and yeast levels (Table 6) as compared to the control plots. The phenol and potassium peroxymonosulfate resulted in the greatest reduction of molds and yeast . Oxygen product resulted in the greatest reductions in salmonellae as compared to the control plans. 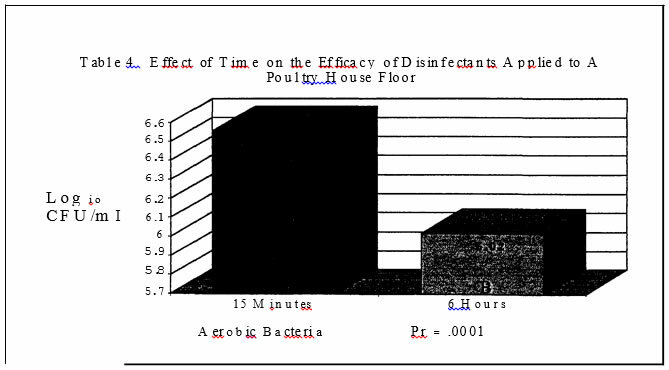 Both products resulted in a log reduction or more of salmonellae as compared to the control pans or pans treated with the Quaternary Ammonia. increase in aerobic bacteria populations seen after six hours in the second trial might have been due to the increased amount of moisture on the plots which occurred with the initial application. 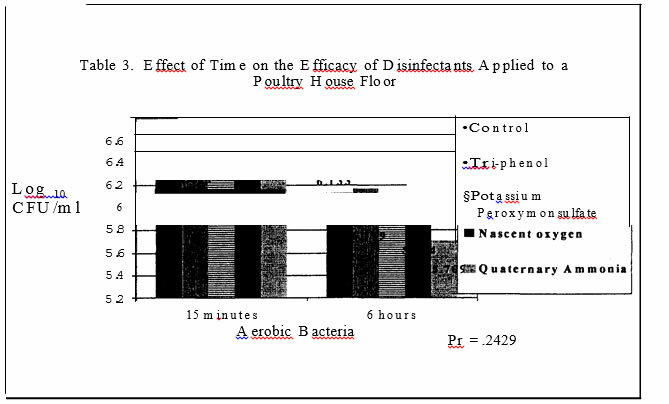 However, by 24 hours the plots were completely dry and the resulting aerobic bacteria.counts had decreased. 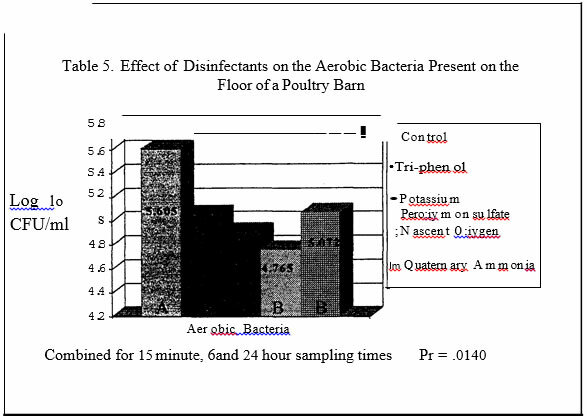 In the field evaluations, all disinfectants resulted in decreased aerobic counts on the floor and upper wall of the poultry houses. 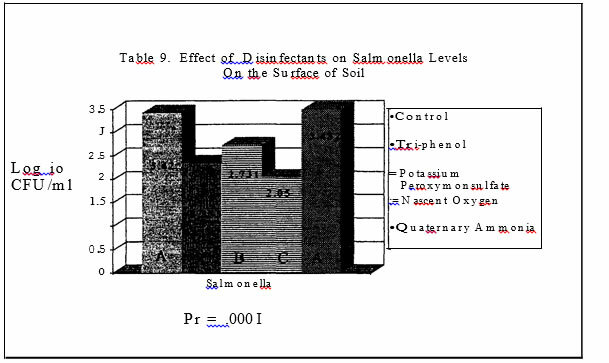 Results of this trial indicate that application rate as well as disinfectant type can impact aerobic bacteria levels and salmonella levels in the surface of soil. Time appeared to be a very effective reducer of bacteria levels. However, it is important to remember that all debrise and loose organic material had been removed prior to disinfectant application. Results might be altered under a heavier organic matter load. Pepper, l.L.,K.L. Josephson, R.L. Bailey, M.D. Burr and C.P. Gerba. 1993. Survival of indicator organisms in Sonoran Dessert soil amended with sewage sludge. J. Environ. and on vegetation. Sewage and Industrial Wastes, 22: 1261-1281. Opitz, Michael, 1996. Disinfecting poultry houses requires attention to details. Poultry Digest, 55:8. Northcutt, Julie K. et al., Editors. Introduction to HACCP: Broiler Live Production, 1999. Proceedings from the Georgia Poultry Federation and The University of Georgia Workshop, November 4, 1999.